A sprawling network of left-wing foundations, non-profit groups, and individual donors and activists may be flouting federal law in advocating an anti-fossil-fuel agenda, according to a major Senate report released on Wednesday. The 92-page report details how those individuals and organizations have disbursed tens of millions of dollars, often shielded from public scrutiny, to sway elections and public policy toward environmentalist goals. Much of the money behind the effort, the report claims, is laundered through non-profit groups prohibited from engaging in political activity. The report, released on Wednesday by the Republican staff of the Senate Environment and Public Works Committee, dubs this network the "Billionaire’s Club." The club, it says, is "adept at converting charitable donations into political outcomes by taking advantage of loopholes in the tax code. Numerous examples raise questions as to whether the charitable donations are indirectly supporting political activity." Three groups form the Billionaire's Club’s fundraising and coordination apparatus: the Environmental Grantmakers Association, the Democracy Alliance, and the "Invest/Divest movement," which seeks to pressure financial institutions to "green" their investment portfolios. Each is integral to the funding strategy detailed in the report. The network funnels money from "charitable" foundations, often through 501(c)(3) "educational" nonprofit groups, to activist organizations that attempt to influence legislation, elections, regulatory actions, or public perception on major environmental issues. The club’s activities are frequently shielded from public scrutiny due to their use of non-profit tax designations that do not require the public disclosure of donors. Groups such as the Democracy Alliance, which operates as an informal collaborative network between wealthy liberal donors and major left-wing organizations, reveal as little as possible about their work coordinating fundraising and advocacy. While opacity in its operations is in itself legally permissible, the EPW report notes, the Billionaire's Club may run afoul of federal laws governing non-profit groups to the extent that the "educational" organizations DA and other Club players launder those funds for eventual use by affiliated lobbying and advocacy outfits. "Their actions may impermissibly exceed the scope of their charitable designation," the report says of a number of non-profits involved in the scheme. DA and EGA solicit funds from some of the nation’s most wealthy left-wing financiers. Washington Free Beacon reporting on the alliance has revealed a network of 153 liberal groups that received $69 million from DA donors last year. Those funds are passed on to groups in two categories of DA support: "aligned network" organizations, and a larger "progressive infrastructure." Supported groups include 501(c)(3) educational groups, 501(c)(4) "social welfare" non-profits, and political independent expenditure groups commonly known as super PACs. "These entities propagate the false notion that they are independent, citizen-funded groups working altruistically," EPW’s report states. "In reality, they work in tandem with wealthy donors to maximize the value of the donors’ tax deductible donations and leverage their combined resources to influence elections and policy outcomes, with a focus on the EPA." The report tallied more than $250 million in fundraising for just 15 organizations. The total includes $53 million for the Environmental Defense Fund, $58 million for the Nature Conservancy, $8.3 million for the Center for American Progress, and $17.2 million for the Sierra Club. Many groups that receive Club support are highly secretive in their operations. Even as DA has worked to reverse policies and Supreme Court decisions that it says erode democracy by injecting "dark money" into the political process, the group works to prevent information about its activities from becoming public, and explicitly advises its donors and supported groups against revealing information about its work. "The scheme [by DA and other Club groups] to keep their efforts hidden and far removed from the political stage is deliberate, meticulous, and intended to mislead the public," EPW’s report claims. One group singled out in the report for its secretive operations is the Sea Change Foudnaiton. Run by wealthy liberal money man Nathaniel Simons and his wife, the foundation provides millions in financing each year for top liberal and environmentalist non-profits, including CAP and the Energy Foundation. More than 40 percent of Sea Change’s funding in 2010 and 2011 – the most recent years for which its annual IRS filings are available – comes from a single Bermuda-based company that appears only to exist on paper. The report cites prior Free Beacon reporting on Sea Change’s activities. The Energy Foundation is the largest recipient of grants from the foreign-funded Sea Change Foundation. However, it appears the Energy Foundation wants to hide donations from Sea Change, as it is not listed as one of the Energy Foundation’s partners despite accounting for 15 percent of EF’s total contributions in 2011. "While it is uncertain why they operate in the shadows and what they are hiding, what is clear is that these individuals and foundations go to tremendous lengths to avoid public association with the far-left environmental movement they so generously fund," the report says. Many of the groups financed by the Club’s extensive fundraising apparatus engage in direct policy advocacy. Those efforts, EPW says, frequently involve work with officials at the Environmental Protection Agency that have deep ties to groups involved with the Club. "The Committee has uncovered evidence that proves President Obama and his EPA are pivotal partners in the far-left environmental movement," EPW says. "The Agency’s leadership under President Obama is closely connected with the Billionaire’s Club and their network of activists." The connections include what the report dubs a "green revolving door" between EPA and groups that frequently lobby the agency for more stringent environmental regulations. "The Agency values and seeks out individuals with ties to large environmental groups for key leadership positions," the report notes. The report also cites instances of explicit collaboration between EPA officials and those environmentalist groups. The efforts include activities by officials as high up as the EPA administrator. According to emails cited in the report, former agency chief Lisa Jackson, operating under her email pseudonym "Richard Windsor," strategized with other agency officials on how best to "solidify the connection" with environmentalist foundations attending an EGA event. The Rockefeller Family Foundation, a Club-affiliated grant-making organization, paid one staffer of the environmentalist group Resources for the Future to serve on the White House Council on Environmental Quality, emails reveal. Michelle DePass, the former assistant administrator for EPA’s Office of International and Tribal Affars, told "Richard Windsor" in an email that the RFF employee would "stake our claim" at the White House. 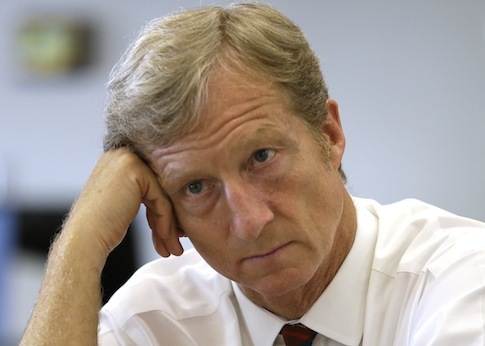 This entry was posted in Issues and tagged Democracy Alliance, Lisa Jackson, Tom Steyer. Bookmark the permalink.